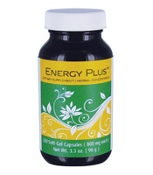 Energy Plus™ soft gelatin capsules combine the antioxidant protection of Vitamin E with the helpful benefits of natural ingredients in an oil base for optimum utilization by the body. Vitamin E, the primary ingredient in Energy Plus™, is a fat-soluble vitamin that protects the body's tissues from the damage of oxidation. * Vitamin E is important in the formation of red blood cells and in the use of Vitamin K.* It may reduce the problems of memory loss and learning associated with normal aging. * Energy Plus™ is enhanced with a proprietary blend of herbs and contains 4% of the daily value of iron.